Abatement/Containment/RestorationThe jobsite can be rugged and tough. That’s why Shurtape offers a full line of tapes that are engineered to perform in the toughest of environments. From excellent adhesion and holding power to easy hand tearability and clean removal, our abatement, containment and restoration tapes are designed for efficiency and performance to help you save time and money. ElectricalYou choose tools that are built for strength and durability – and that includes the tapes you use for electrical and mechanical protection applications. Whether used for primary insulation, as a jacketing or for phasing, Shurtape engineers its products to meet – and exceed – the industry’s expectations for quality and performance. So you can be confident every job, big or small, lives up to your exacting standards. General ConstructionYou never know what challenge you will face next. When arming yourself with versatile products is critical to getting the job done quickly and efficiently, you can trust Shurtape to deliver. No matter what the job entails, you can be confident you have the tools you need to finish the job. HVAC/InsulationWhen the quality of your work relies on your ability to produce an airtight bond on joints and seams, you need products that meet your tough standards. 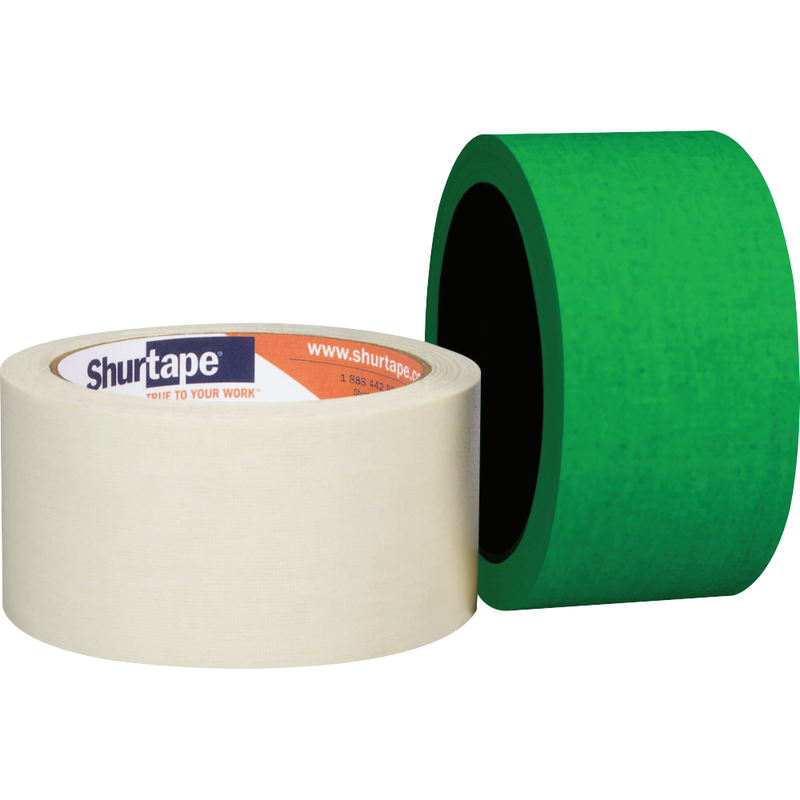 Whether you’re working in vast temperature ranges, need a maximum-strength solution, or a tape built for aesthetics and performance, you can count on Shurtape to be reliable, roll after roll. Paint MaskingPainting requires attention to detail. There’s no time for touch-ups or uneven lines, so it’s critical to choose the right tools for the job. Shurtape offers a range of paint masking tapes, with options for various surfaces and applications, to deliver performance you can be proud of. Stucco MaskingThorough preparation is a requirement of the job. That’s why you demand tapes that are easy to apply, strong enough to withstand the harsh scraping of a trowel, and easy to remove with no residue left behind. When it comes to leaving your mark of excellence, you count on Shurtape’s stucco tapes to meet the rigid requirements of the job. Gaffer'sWhen performance and quality are critical considerations in motion picture, audio/visual, television, theatrical and photography applications, trust our matte-finish Gaffer’s tapes. Available through our strategic alliance with Pro Tapes®, these tapes offer excellent temperature resistance and adhesion, as well as easy, clean removal. 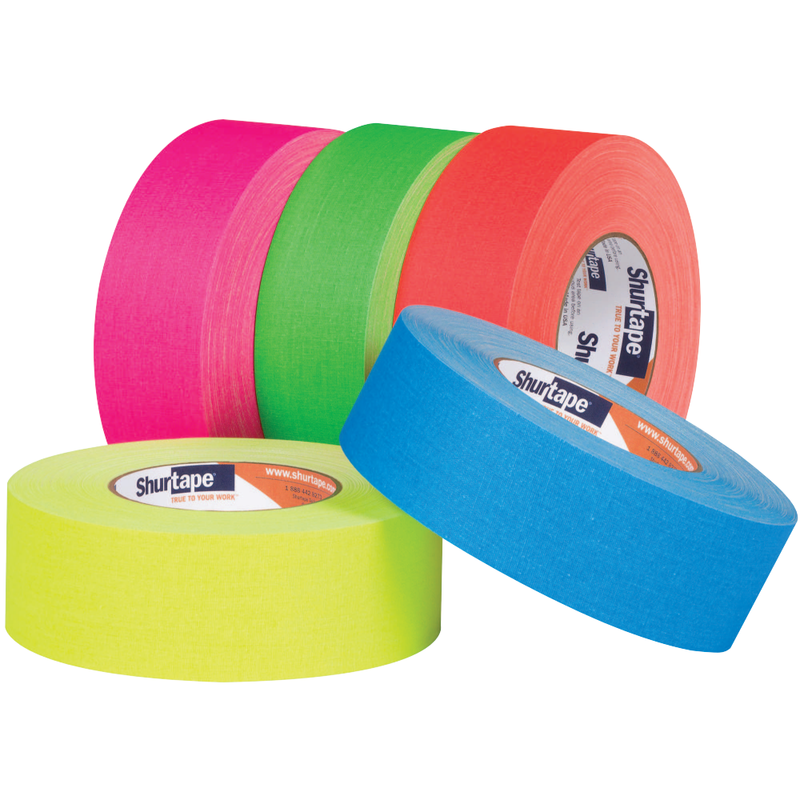 Safety & MarkingWhether you are marking aisles, floors or stage directions, or identifying safety zones and hazard or trip areas, Shurtape offers a variety of tapes for color-coding and lane-marking applications. Available in a range of colors and warnings, you are sure to find a tape that reflects your commitment to safety. Stage/Area PrepFrom taping down cables and securing props to bundling wires and marking directional signage, the show can’t go on until the stage is properly prepped. That’s why we put so much time and attention into every roll of tape we craft. So you can be confident the stage is set before the curtain is raised. Industrial MROYou know each job is different. It’s why Shurtape offers an extensive line of tapes for industrial MRO applications. So, no matter the features you demand, you can find a tape engineered specifically for you. Facilities MaintenanceWith an ever-growing to-do list, you don’t have time, effort or resources to waste on products that don’t work. Whether making a repair, adding a coat of paint or color-coding and marking safety areas, you can be confident you’ll find a tape that will stand up to the most demanding applications. JanitorialFrom janitorial to maintenance duties, your job centers on efficiency and cost savings. That’s why Shurtape’s product line is built for versatility and durability – so no matter what the day brings, you’re armed and ready to take it on. Mounting & SplicingStrong hold. Easy handling. Tough construction. From mounting and fastening to splicing and bonding, get a grip with Shurtape’s mounting and splicing tape portfolio. Steel Pipe CoatingEvery aspect of the steel pipe coating process is critical – from pre-heat to coating to masking pipe ends. Even something as seemingly simple as tape plays a vital role. That’s why Shurtape’s tape solutions are built to take the heat. TransportationYou demand products that won’t fail or flag under stress. We deliver with a growing line of high-quality, proven performance tapes for a range of sealing, seaming and bonding applications. ConvertingVersatility is a requirement for your unique industry. While some applications may require high tack and superior adhesion, others may demand strength and durability. Our product solutions are adaptable and flexible – so you can find the perfect tape for your ever-changing needs. Cloth & Duct TapeShurtape’s portfolio of silver and colored cloth and duct tapes is as versatile as it is durable. With options for light to heavy duty, and All-Purpose to Professional grades, we’ve got you covered, no matter what the job demands. Double-Coated TapeDesigned for a wide range of applications, Shurtape double-coated paper, film and cloth tapes are crafted with the specific adhesive properties and product features you require to get the job done. Foil, Film & Foam TapeYour specs are exacting. Our approach to making tapes is the same. That’s why we demand versatility, durability and quality from every roll of foil, film and foam tape we craft. Packaging TapeThe job is diverse – so are the tools you use. That’s why our broad range of packaging solutions – for light to heavy duty use and everything in between – offer a combination of quality, precision and superior results. Paper TapeNo matter the performance characteristics you demand – from easy tear at the start of the job to clean removal at the end – Shurtape paper tapes meet the requirements of a range of applications. Printer ConverterCombining superior performance with excellent ink anchorage without pickoff, Shurtape printable tapes deliver your message loud and clear to help you leave a great first impression. Automated Carton SealingYou demand case sealing solutions that can maximize throughput to save time and labor. From light- to heavy-duty applications, our packaging tapes deliver excellent adhesion and holding power. And, our tape applicators offer unique features and quick changeovers to keep lines running efficiently. Bundling/PalletizingWhether it’s a light or heavy load, you trust your tape to keep your cartons, pallets and bundles secure, despite the rigors of the storage and shipping environment. Shurtape delivers with a wide array of tapes that stick quick and hold strong in palletizing, unitizing and bundling applications. Manual Carton SealingIn manual carton sealing applications, being armed with a quick, easy-to-use tape applicator is critical. That’s why Shurtape offers an assortment of hand and desktop tape dispensers with features such as improved wipe-down, pistol grip and safety cutting blades – to ensure you have the right tools to tackle the job. Printer ConverterOftentimes your packaging speaks volumes. Trust Shurtape directly printable packaging tapes to communicate your text and graphics cleanly and clearly. Combining superior performance with excellent ink anchorage without pickoff, these tapes are sure to help you leave a great first impression. SpecialtyNo matter the task at hand – from packaging and bundling to sealing and everyday use – Shurtape has a tape to get the job done. Cloth & DuctWe know all jobs have one thing in common: they must be done right. That’s why our complete line of cloth and duct tapes is engineered to exacting specs. When easy handling, varying adhesion levels and durable construction characteristics are needed, trust Shurtape to give every job a distinctive mark of excellence. Coated ClothWe offer a complete line of matte-finish coated cloth and gaffer’s tapes for use in the arts and entertainment, photography and book-binding industries. With excellent temperature resistance, adhesion, and clean removal these tapes also meet the high standards required for HVAC and industrial use. General Purpose DuctDesigned for everyday applications such as bundling, sealing, seaming, repairing and holding, our general purpose duct tapes make quick work of the task at hand. Heavy Duty DuctDesigned to withstand tough and rugged conditions, Shurtape heavy duty duct tapes are enginereed to deliver superior adhesion and holding power, job after job. Professional DuctWhen you need a tough, reliable tape, count on Shurtape professional duct tapes to get the job done. For ultimate durability, choose a tape made with Polybonded CO-EX Technology®, a seamless construction that adds strength and will not delaminate. Foil, Film & FoamWe know your reputation is on the line. That’s why we offer a comprehensive assortment of foil, film and foam tapes that are engineered for performance in a range of jobs, from HVAC and insulation to electrical, safety marking and more. With options that meet the code, perform in the cold and deliver superior results, Shurtape has you covered with the tapes you need to ensure your work exceeds your exacting standards. Aluminum Foil & FilmDesigned to form an airtight, moisture-resistant bond on joints and seams, Shurtape aluminum foil and film tapes provide consistent quality roll after roll so your job is done right the first time. CompositeYour standards are high, particularly when it comes to the products you choose to get the job done. Shurtape’s composite tapes are built for aesthetics and performance – no matter the temperature or environmental conditions. ElectricalShurtape electrical tapes are engineered for durability, strength and consistent performance in a range of electrical and mechanical applications. Whether for primary insulation, as a jacketing or for phasing, you can be confident these tapes will meet the demands of the job. Polyethylene/PVC FilmFrom masking and wrapping to marking and shielding, Shurtape polyethylene and PVC film tapes deliver uncompromising performance. SpecialtyShurtape specialty foil, film and foam tapes combine the product features you demand with superior performance to deliver a solution that’s engineered to hold strong and last long, strip after strip. PaperWe know your time is valuable. That’s why our masking and paper tapes are engineered to meet the demands of a range of jobs. Whether you require tensile strength, temperature resistance, removability, flexibility or sharp paint lines, Shurtape delivers. General PurposeShurtape general purpose masking tapes are effective and economical solutions for non-critical applications ranging from packaging, bundling and holding to splicing, masking and labeling. Painter'sWhen sharp lines and no residue are the priority, trust Shurtape painter’s tapes. With options for a variety of surfaces, and features such as easy unwind and quick stick, these masking tapes are designed as a tool to make your job easy. PerformanceShurtape performance masking tapes are engineered to take on the heat, yet removal cleanly when the job is done to help tackle a variety of industrial applications. These tapes won’t leave behind adhesive residue, only sharp paint lines. SpecialtySome jobs demand particular performance characterics. Our specialty masking tapes are engineered to meet the most specific needs. PackagingWe know every sealing situation is unique. And we understand that keeping your lines running at peak production, while producing a better, more reliable case seal is a priority. That’s why our portfolio of packaging tapes is purpose-built for packaging and case sealing applications – to deliver secure seals, every time. AcrylicFor light to heavy duty applications, Shurtape AP Series acrylic carton sealing tapes are designed to give you the long-lasting performance you demand. For added functionality, AP Series tapes perform in extreme temperatures and are UV resistant to protect against yellowing. Hot MeltFrom manual packing stations to automated lines, Shurtape HP Series hot melt packaging tapes are built to maximize throughput to save time and labor. For secure seals and added production efficiency, HP Series offers the highest holding power to fiberboard in the industry and performs reliably down to the core. Office & SpecialtyShurtape specialty tapes are designed for a range of applications, including packaging, bag sealing, mounting, holding and everyday office use. PrintableA package says a lot about the company it’s from. Shurtape Surface Printable packaging tapes allow text and graphics to appear clean and clear, while delivering a secure and reliable seal. Stock & Custom PrintFrom preventing pilferage to informing handlers of special care instructions, with Shurtape printed packaging tapes, you can deliver a secure seal – and a clear message – with every package. StrappingShurtape strapping tapes are engineered to keep pallets and bundles in-tact – whether it’s a rough ride on a semi or a transcontinental flight. For added durability and performance, GS Series features a polypropylene backing that prevents splitting or cracking and resists moisture. Water-ActivatedDesigned for fast, permanent adhesion, including on hard-to-stick-to cartons such as 100 percent recycled, Shurtape non-reinforced and reinforced paper tapes become “one with the box” to provide the performance and security you need to eliminate piflerage concerns. Double-CoatedWe know you demand versatility to get the job done. That’s why we have engineered a comprehensive assortment of double-coated tapes, including paper, film, cloth and transfer adhesive options. Whether you’re mounting, splicing, joining or laminating, these tapes have one thing in common: an unsurpassed level of quality. Tape ApplicatorsWe know you demand secure carton seals, whether applying tape by hand or in an automated case sealing environment. That’s why we offer a wide range of hand-held tape dispensers and automated case sealing solutions. Designed for a range of packaging, strapping and adhesive transfer applications, our tape applicators are engineered for maximum efficiency and performance. ManualDesigned with comfort and ease of use in mind, our selection of hand-held tape dispensers help you tackle a range of manual case sealing, strapping, bundling and palletizing jobs. From taping down cables and securing props to bundling wires and marking directional signage, the show can’t go on until the stage is properly prepped. That’s why we put so much time and attention into every roll of tape we craft. So you can be confident the stage is set before the curtain is raised. Professional grade gaffer's tape for general applications in the convention, hospitality, exhibition, trade show and A&E industries. Professional grade gaffer's tape suited for general use in the convention, hospitality, exhibition and trade show industries, as well as in the audio/visual, television, photography, theatrical and motion picture industries to bundle wires, tape down cords, lighting and props, and mask silk screen frames. Durable P- 628 offers a combination of excellent holding power, conformability and high tensile strength to get the job done quickly and efficiently. Professional grade gaffer's tape available in a variety of matte-finish fluorescent colors. Glow-in-the-dark specialty gaffer's tape for safety marking and other tasks; offers residue-free removal.